I created this card for a friend’s birthday recently. Since she has a springtime birthday and was born in Japan, I thought cherry blossoms were very fitting. These papers from Graphic 45 are so pretty. I didn’t follow a specific sketch for this, although I’m sure there is one out there like it! I have not been good at posting lately (Sorry, Mom! ), but I’ll try to catch up and post more! 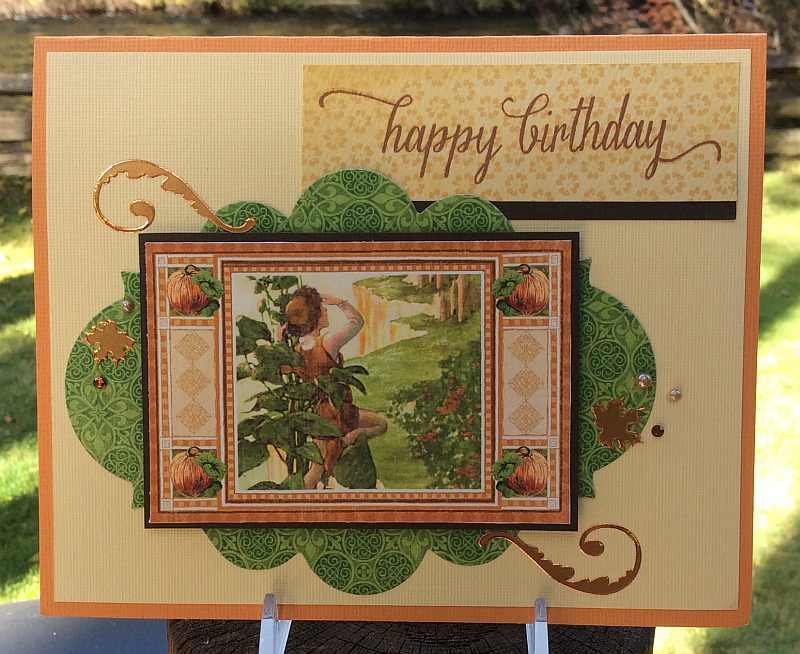 I’ve got Jack and the Beanstalk featured for this card. This Graphic 45 paper collection is so pretty and it includes a number of Eerie Tales with sort of a Halloween theme. The copper colored stickers work nicely with the oranges in the papers. I’ve had those stickers in my stash for quite some time as well as the little blingy bits! I think this fits the “It’s the Most Colorful Time of the Year” challenge at Shopping Our Stash, since I used a number of Fall colors, plus green. Thanks for visiting today.